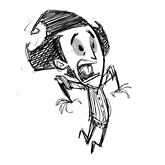 I'm plaing don't starve and i dont know how i drop items from the inventory on the ground using key shortcuts. Please help. Since these headstones are here, why not give them more of a use instead of just for marking graves. Make it so you can break one with a hammer or pickaxe and get rocks or cut stone out of it. Do we have a definitive fire source guide yet? Somehow, an issue I've encountered is my game has started halfing every item in my inventory when I try to swap it. I'd like to know if this is intentional and I just toggled something wrong or if this is an actual issue and as such needs to be fixed. I was playing as Willow, if it's maybe just a character bug, I've not had this with Wilson yet. Suggestion [Rethought]: Make Beefalo your mount. Anyone who has read my last thread about making Beefalo your mount should know that one thing that I've noticed on many of my worlds is that the best food sources, mining grounds and pig villages are almost always quite a long journey away, this always makes me hesitant to go out to that spot in case I have to camp over night on the journey. To solve this, I propose that once baby Beefalo are added, a saddle could also be added to the game to be unlocked in the Alchemy Engine. I imagine that it would require 4 rope, 5 pig skin and 2 gold nuggets (For the little metal things where you place your feet while riding.) and after creation you would be able to saddle up a Beefalo to ride around the map at about 1.5 or 1.75 times your normal movement speed. But obviously you can't just try to saddle up a fully grown Beefalo and expect it to let you ride on its back! This is where the baby Beefalo is necessary. You would have to feed the baby a grass tuft (Or more if you think 1 is too easy) in order to tame it, then you would have to wait for it to grow up in order to place the saddle on it. Of course you may need a place to store your baby Beefalo when its growing up? Or else it might wonder off somewhere or be attacked by hounds. For this problem, I suggest a new structure to be added. Nothing too extravagant, just a wooden pole with a piece of rope attached to it where you can tie your new friend up to in order to keep it safe from harm. I would imagine the pole to require 1 log (For the pole. ), 2 rope (For the, well, the rope.) and 3 or 4 cut stone (For the base of the pole.) This recipe would also need to be unlocked at the alchemy engine. Once the Beefalo has grown up after maybe 7 to 10 days (Please feel free to discuss this time if you consider it to be too long or too short!) you could unattach it from the pole and saddle up! But maybe you think that this is too simple, too easy. Or maybe you don't actually want to ride a Beefalo (Where is your soul? ). Let me answer these two points in turn: To make it harder I suggest that hounds try to hunt you down whilst riding your Beefalo at sunset and at night the "Scary Monster" still tries to kill you. This will force most players to dismount at sunset and walk the rest of the way, their Beefalo following them or to set up camp quickly. As for not wanting to ride a Beefalo, I suggest that another item could be created to be equipped instead of the saddle, a 9-slot Beefalo backpack, effectively a moving chest that follows you when untied from the pole and rope. I would want the recipe for this to include a fair amount of grass (Maybe 6) for weaving, 4 twigs to hold it up and 2 rope to attach it to your furry companion. This could also be useful for that tricky "Backpack or Logsuit" choice that many people complain about (Personally I like the choice as it adds more of a risk to adventuring.) but it could also be used as even more storage space if you have both the backpack and the Beefalo Pack equiped. Another idea that was suggested in my last thread was to have a logsuit for the Beefalo, making it able to take more damage before you have to dismount and kill the attacker. So for this I propose that the an item known as the Battle Saddle (Or something similar.) could be added to the game. Its recipe would require a normal saddle, 4 rope and 10 logs. (Beefalo are big remember.) This item would allow you to ride your Beefalo and act as armour for it. Finally, in order to make this suggestion sound less over powered, you should only be able to tame a maximum of one or two Beefalo so that players can't just have a convoy of moving chests following them, you shouldn't be abble to use the powerful Beefalo attack (Or the "Beefalo Beatdown" as I like to call it.) and trying to take away a baby Beefalo should somehow anger the herd/pack. Thanks for reading, Please give me your ideas in the form of a reply in this thread! I hope this idea gets noticed! As I was playing I came to the idea that I should be able to view and rearrange the contents of a backpack that is placed on the ground. Although it isn't a necessity, I think being able to manage a backpack while it is not being worn by the player is enormously helpful in terms of time management and also it is just less of a hassle. In essence all I am suggesting is that a backpack have a "RMB View Contents" option while sitting on the ground, the traditional "LMB Pick up" would remain untouched. Positives: Less micro-management of the inventory and rearrangement when trying to grab something out of a backpack. Negatives: Backpacks all of the sudden become more like an alternative to chests, at the cost of only one inventory slot. The only way I can think of lessening this effect is by adding some kind of durability to Backpacks which is a whole other issue. Overall I think the addition of being able to manage backpacks without equipping them is a good thing, and does not carry too many bad attributes with it (other than that stated above). What do you think, is it too aesthetic, not practical enough, or is there more to it? Okay, so I have a base camp and that's where I keep chests filled with extra items (food, resources, food, log suits, food, and more food). The problem I have is that I keep needing to craft more and more chests. What I find odd is the fact that chests are stationary objects and yet hold only half as much inventory as your character. Why is that? At the very least a chest should be able to store as many items as your character can carry. If this were done then it would dramatically reduce the number of chests we need and allow for more organized storage by virtue of the additional space. The only downside I can see is that this would require a larger pop-up window that would obscure more of the screen, but as this would be temporary I don't see it as a huge issue. Besides we can manually close or move away froma chest in an emergency (where we need to see the screen).